This is the Northwest Minnesota Birding Report for Thursday, January 26, 2012 sponsored by the Detroit Lakes Regional Chamber of Commerce. You may also hear this report by calling (218)847-5743 or 1-800-433-1888. We are in the midst of another mild week in this really odd winter. Days are getting longer and the warm temperatures are giving people and birds spring fever. Brad and Dee Ehlers found a RED-BREASTED MERGANSER at the outlet of Ottertail Lake on Otter Tail County on January 25. They report that TRUMPETER SWANS are easy to see and photograph in the Ottertail River at the east end of downtown Fergus Falls. In Polk County, Kelly Larson found two SNOWY OWLS ON January 21. One was along 160th AVe SW a half mile S of CR 45, the other north of US 2 on 260th St SE west of 170th Ave SE. She also saw ten ROUGH-LEGGED HAWKS, RUFFED GROUSE, SHARP-TAILED GROUSE, 86 GREATER PRAIRIE-CHICKENS, two BLACK-BILLED MAGPIES, two NORTHERN SHRIKES and 90 SNOW BUNTINGS in the area. Sandy Aubol in East Grand Forks reported that the over-wintering EASTERN TOWHEE, WHITE-THROATED SPARROW, and two HARRIS'S SPARROWS are still coming to her feeders. A NORTHERN CARDINAL is also coming regularly. Heidi Hughes saw a SHORT-EARED OWL and NORTHERN HARRIER on 190th St NW and CR 68, and twelve ROUGH-LEGGED HAWKS along MN 1 between Radium and Thief River Falls. On January 24 , Sandy Aubol saw a flock of 200 CANADA GEESE in East Grand Forks near the Crystal Sugar lagoons. Shelley Steva saw COMMON RAVENS in Oklee in Red Lake County on January 25. In Pennington County on January 20, Shelley saw a ROUGH-LEGGED HAWK along CR 3 two miles east of the Casino. Two COMMON RAVENS were seen in the city of Thief River Falls. Thanks to Brad and Dee Ehlers, Heidi Hughes, Kelly Larson, Sandy Aubol , and Shelley Steva for their reports. This is the Northwest Minnesota Birding Report for Thursday, January 19, 2012 sponsored by the Detroit Lakes Regional Chamber of Commerce. You may also hear this report by calling (218)847-5743 or 1-800-433-1888. The cold has surely found us now, but we are still short of snow in the northwest. The last few days have brought the birds to the feeders again looking for additional food. Also , reports of SNOWY OWLS are increasing again , perhaps indicating that they are starting to return north. On January 13, Beth Siverhus saw a NORTHERN SHRIKE and two ROUGH-LEGGED HAWKS along MN 11 between Salol and CR 9 in Roseau County. Two BALD EAGLES were hanging around their nest a mile east of Warroad near a gravel road. On the 14th, a PILEATED WOODPECKER came to her feeder in Warroad. Katie Haws reported some COMMON REDPOLLS, and three PINE GROSBEAKS at her feeder near Blackduck in Beltrami County on January 15. Shelley Steva and I found a SHARP-SHINNED HAWK in western Clearwater County on January 15. In Polk County Heidi Hughes saw a SNOWY OWL on 190th ST NW near 230th Ave NW not far from the Audubon Center on January 15. Other species in the general area included BALD EAGLE, NORTHERN HARRIER, and ROUGH-LEGGED HAWKS. Sandy Aubol reports that the cold weather has brought many more birds in to her feeders in East Grand Forks including a NORTHERN CARDINAL, the EASTERN TOWHEE, two HARRIS'S SPARROWS, WHITE-THROATED SPARROW, and about 45 HOUSE FINCHES. Kelly Larson found a BELTED KINGFISHER along Becker CR 158 fishing over an open creek. A RED-BELLED WOODPECKER was seen at White Earth, and 83 WILD TURKEYS crossed the road just east of Ponsford on MN 225. From Hubbard County on January 19, Marshall Howe reported seeing a RUFFED GROUSE, NORTHERN HARRIER, and ROUGH-LEGGED HAWKS. At the feeder near Dorset, were DARK-EYED JUNCOS, COMMON REDPOLLS, and AMERICAN GOLDFINCHES. Eric Doll reported a SNOWY OWL in Otter Tail County last week a mile north of Otter Tail on CR 78. Alma Ronningen in Dent on January 19 reported HARRIS'S SPARROW, DARK-EYED JUNCO, COMMON REDPOLLS, and HOUSE FINCHES at her feeder. Thanks to Alma Ronningen, Beth Siverhus, Eric Doll, Heidi Hughes, Katie Haws, Kelly Larson, Marshall Howe, and Sandy Aubol for their reports. Please report bird sightings to Jeanie Joppru by email, no later than Thursday each week, at [email protected] OR call the Detroit Lakes Chamber's toll free number: 1-800-542-3992. Detroit Lakes area birders please call 847-9202. Please include the county where the sighting took place. The next scheduled update of this report is Thursday, January 26, 2012. 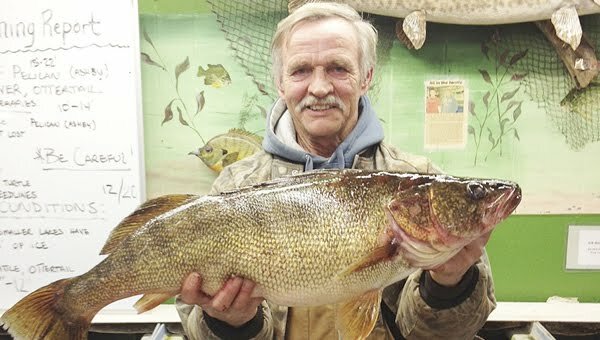 Fishing has been outstanding in the Otter Tail County area the past few weeks…especially for Gary Leabo of Underwood who landed this 33-inch, 13-pound, 3-ounce walleye Jan. 3, on West Battle Lake. He was using large golden shiners. We don’t have snow…but the ice is plenty thick. Call today to schedule your next ice fishing trip! Story here: http://www.fergusfallsjournal.com/2012/01/10/monster-walleye/. This is the Northwest Minnesota Birding Report for Thursday, January 12, 2012 sponsored by the Detroit Lakes Regional Chamber of Commerce. You may also hear this report by calling (218)847-5743 or 1-800-433-1888. The cold has finally found us for a day or two, but the northwest is still relatively snow-free. With the colder weather, more birds are visiting the feeders, and a few late migrants still surprise us. Mark Otnes observed SHARP-TAILED GROUSE, ROUGH-LEGGED HAWS, NORTHERN HARRIER, BLACK-BILLED MAGPIE, and several flocks of SNOW BUNTINGS were also seen in the county. Bob Ekblad relocated the SNOWY OWL in Otter Tail County on January 10, on township road 255 just off CR 78. Along CR 78 he found more than 250 TRUMPETER SWANS. Gary and Marion Otnes found a BARRED OWL, a GREAT HORNED OWL, and AMERICAN TREE SPARROWS south of Fergus Falls. Heidi Hughes reported a TOWNSEND'S SOLITAIRE at the Audubon Center near Warren on January 8. The bird was near the Omdahl House on the property. A GREAT HORNED OWL was also seen at the sanctuary, and a NORTHERN HARRIER was at the impoundment north of the sanctuary. BLACK-BILLED MAGPIE, and ROUGH-LEGGED HAWKS were seen along 190th St NW. Katie Englemann saw a SNOWY OWL north of Gully on January 5. As of January 12, the EASTERN TOWHEE, 2 HARRIS'S SPARROWS, and one WHITE-THROATED SPARROW was still visiting her feeders at East Grand Forks. On January 10, a NORTHERN CARDINAL came to her yard. A SHARP-SHINNED HAWK visited the yard on January 12. A BALD EAGLE and a flock of 28 CANADA GEESE flew over East Grand Forks on January 6. Anita Vettleson reported a PILEATED WOODPECKER at her home near Oklee in Red Lake County on January 12. On January 7, I saw a NORTHERN SHRIKE along Johnson Drive in Pennington County. On January 8, Shelley Steva and I saw a MERLIN in Warren. Two EURASIAN COLLARED-DOVES and a COMMON GRACKLE were seen in Argyle. A GOLDEN EAGLE was seen north of Stephen, and a SNOWY OWL was along MN 75 north of Warren. Other species seen in Marshall County this week included a SHARP-TAILED GROUSE, several BALD EAGLES, a number of ROUGH-LEGED HAWKS and COMMON REDPOLLS. Maggie Anderson reported a NORTHERN SHRIKE on the east side of Agassiz NWR on January 12. Martin Kehoe saw a GREAT GRAY OWL east of Shooks in Beltrami County and another in Koochiching County 0.3 miles west of the intersection of MN 1 and MN 71. Shelley Steva and I in Kittson County on January 8, saw a NORTHERN CARDINAL at Larry Wilebski's cabin, and a SNOWY OWL on the south edge of Northcote. Other species seen in Kittson County that day included ROUGH-LEGGED HAWK, PINE GROSBEAK, HOUSE FINCH, and COMMON REDPOLL. Martin Kehoe reported that the SPRUCE GROUSE have started to come to his grit station in the Red Lake WMA. Thanks to Anita Vettleson, Bob Ekblad, Gary Otnes, Heidi Hughes, Katie Englemann, Maggie Anderson, Mark Otnes, Martin Kehoe, and Sandy Aubol for their reports. This is the Northwest Minnesota Birding Report for Thursday, January 5, 2012 sponsored by the Detroit Lakes Regional Chamber of Commerce. You may also hear this report by calling (218)847-5743 or 1-800-433-1888. Snow finally came to the northwest at New Year's , but today when the temperature was over 40 degrees, much of it disappeared. Birding has been slow this week, probably since there is plenty of food available that is not buried in the snow, so birds don't have to look for other sources of food. The Beltrami Island CBC was held on December 29 and birds were hard to come by, but several interesting species were seen including two GREAT GRAY OWLS. One was along the Bankton Forest Road, the other deep within the Beltrami Island Forest some distance from the roads. Other species seen included SPRUCE GROUSE, NORTHERN GOSHAWK, several GRAY JAYS, BOREAL CHICKADEES, and PINE GROSBEAKS. Dave Alexander reported a GREAT GRAY OWL along Shoreline drive north of Upper Red Lake. On December 31, the Roseau CBC found BLACK-BILLED MAGPIES, 25 COMMON RAVENS, NORTHERN SHRIKE, PINE GROSBEAKS, and COMMON REDPOLLS among others. Larry Wilebski reported PILEATED WOODPECKERS, BLACK-BILLED MAGPIES, a NORTHERN CARDINAL and 75-100 COMMON REDPOLLS in Kittson County on January 2. In Beltrami County on December 29, Marshall Howe saw a GREAT GRAY OWL along MN 72 eleven miles south of Waskish in Beltrami County. Cliff Steinhauer reported seeing several ROUGH-LEGGED HAWKS, and GREAT HORNED OWL in Marshall County near Agassiz NWR on December 28. Heidi Hughes in Polk County reported a NORTHERN HARRIER at the Agassiz Valley impoundment near the Audubon Sanctuary on December 29. A BROWN CREEPER was seen at the feeders there. Several ROUGH-LEGGED HAWKS were observed in the area, and a SNOWY OWL was seen along CR 21 near Sherack. Sandy Aubol reported that on January 1, the EASTERN TOWHEE, several DARK-EYED JUNCOS, WHITE-THROATED SPARROW, and two HARRIS'S SPARROWS came to her feeder on January 1. Leon Thoreson reported a male NORTHERN CARDINAL in the cemetery at Crookston on January 4. In their yard near Climax, they had MOURNING DOVE, DARK-EYED JUNCOS, and PINE SISKIN. Only one SNOW BUNTING came to the feeder on New Year's Day. Dan and Sandy Thimgan reported that a SNOWY OWL continues to be seen near Ottertail in Otter Tail county on January 5. To get to the site from the town of Ottertail , go north from Ottertail on CR 78 for 1.5 miles. The bird was seen on the power poles near the intersection with CR 54. Thanks to Alma Ronningen, Cliff Steinhauer, Dave Alexander, Heidi Hughes, Larry Wilebski, Leon Thoreson, Marshall Howe, and Sandy Aubol for their reports. Please report bird sightings to Jeanie Joppru by email, no later than Thursday each week, at [email protected] OR call the Detroit Lakes Chamber's toll free number: 1-800-542-3992. Detroit Lakes area birders please call 847-9202. Please include the county where the sighting took place. The next scheduled update of this report is Thursday, January 12, 2012.